It was like David and Goliath. Flemming, the Elmore Stoutt High School House that has won 15 titles versus Lettsome House, the on with the least championships with eight, competing in the 47th edition of the event on Wednesday and Thursday at the A. O. Shirley Grounds. Trailing Flemming House by 30 points after the completion of pre inter house sports day events, Lettsome House overhauled their nemesis to become the last of the four houses to win four successive titles. In winning their ninth overall championship in the 47-year history of the competition, Lettsome amassed 938 points to Flemming's 894. Carlisle-the first house to win five successive titles between 1971-75, was third with 717 while O'Neal rounded out the competition with 437. Ariyah Smith of Flemming House won the 13 and Under Girls Division with 50 points while O'Neal's Khybah Dawson tallied 46 for the Boys' crown. Zara Brown of Flemming House had 44 points for the 15 and Under Girls Division victory while Jaleel Croal of Carlisle House finished with 42. Lettsome House's Arianna Hayde won the 17 and Under Girls Division after amassing 46 points with Jelani Norman of Carlisle House garnering 44, for the Boys equivalent. Lettsome House's Mya Walwyn had 40 points and claimed the 20 and Under Girls title, while Lettsome's Joshua Lynch and Carlisle's Akeem Bradshaw, tied for the 20 and Under Boys Division with 30 points respectively. Flemming's Ariyah Smith with 50 points was the Victrix Ludorum and O'Neal's Khybah Dawson's 46 points earned him the Victor Ludorum. Several Division records were established as well. Djimon Gumbs improved his 17.20m (56 feet 5½ inches) Shot Put effort from two weeks ago with a mammoth heave of 17.52m (57 feet 5½ inches) on his final attempt. 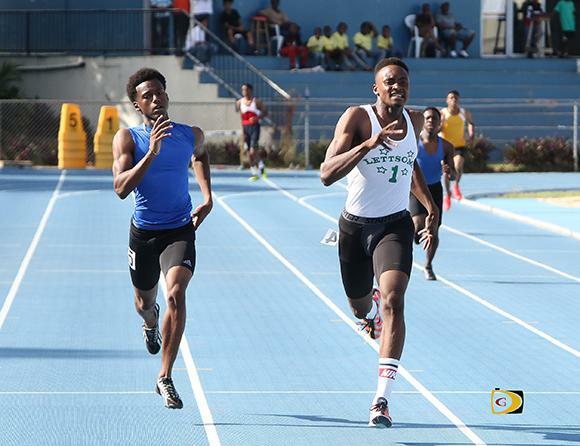 Adrino Gumbs of Lettsome House ran 48.62 seconds in the 400m to demolish Tarique Moses' 49.97 seconds from 2012. He also won the 100m in 11.02 seconds aided by a 4.2 meters per second tailwind. Lettsome House's Rakeel Jack overhauled O'Neal House's Josh Hill in the last 30m to win the 17 and Under Boys 400m in 49.90 seconds to 50.35. Both Jack and Hill were under Kyron McMater's 50.49 seconds from 2013. O'Neal House's Beyonce DeFreitas took down Nelda Huggins' 24.33 seconds 200m mark from 2012 in the 17 and Under Girls event with a time of 23.98 seconds, .01 off her best at the 2016 Carifta Games in Grenada. She claimed the double running 56.02 in the 400m, a time that eclipsed Lakeisha "Mimi" Warner's 57.12 seconds established in 2012. Carlisle House's Akeem Bradshaw, had a notable performance in the 20 and Under Boys 200m running a time of 22.21 seconds.